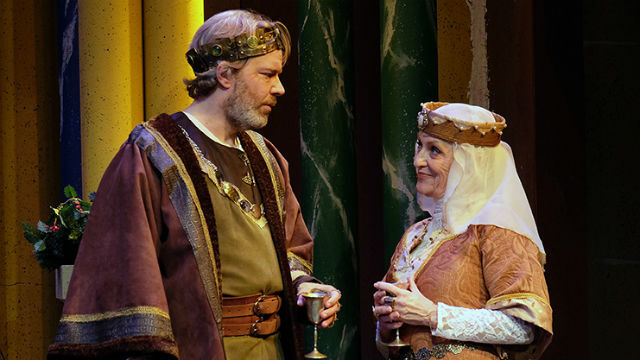 Jason Heil and Dagmar Krause Fields in “The Lion in Winter” at Moonlight Stage in Vista. “We’re jungle creatures,” the Queen says to the King. But, as portrayed in James Goldman’s magnificent 1966 comic drama, Eleanor of Aquitaine and Henry II are far worse than that. The 12th century English monarchs are carnivorous beasts, who eat their young. Those offspring, one might say, deserve being eaten — and worse. They’d as soon see their parents dead; they even plot assassination. The murderous triumvirate, well known to history, are the angry, bellicose Richard (AKA the Lionheart), conniving, ignored Geoffrey and pimpled, immature John (who ultimately, like Richard, becomes King). Of course, all the while that they’re hating on their parents, they’re desperate for affection and attention. Watching this monstrous, devious family is reality TV long before its time. Goldman’s writing is brilliant; the quips and barbs fly at lightning speed – and always hit their target. Add into the mix the scheming young King of France, and his sister, Alais, Henry’s lover, promised to Richard in marriage, but demanded by John. Though Alais is everybody’s pawn, in the Moonlight Stage production, she has her own mind — and a will of steel. She winds up being a player as well. And it is all a game, the way Richard and Eleanor amuse themselves. To achieve the delicate balance of humor, history and credibility, exquisite timing, pacing and tone are required. Director Jason Heil, who also makes a spectacular Henry, totally captures all the pomp, cunning and mutual manipulation. There’s not a weak link in his marvelous cast. At the center, of course, is the fraught, love/hate, pushme/pullyou relationship of the King and Queen. She has militarily attacked him so many times, he’s locked her away in a tower for ten years. Now, in the winter of 1183, he’s let her out for Christmas. And the family has a field day, vying for the throne and conspiring to gain the valuable Aquitaine territory. It becomes a deadly royal mosh-pit, as each tries to outwit the others. This is Russian roulette, Plantagenet style. And it makes for a very juicy and funny (if somewhat melodramatic) evening of theater. As Heil’s well-matched mate, Dagmar Krause Fields gives as good as she gets — and she’s her best ever, as a clawed harridan, who has a kiss and a killer plan for everyone. Zachary Bonin is aptly forceful and pugnacious as Richard, Benjamin Cole has the perfect neglected middle-child temperament, turned to manipulative malice; and Reed Lievers makes John infantile and ineffectual, not totally doltish, as in some productions. (as King, John is, after all, the one who winds up drafting the Magna Carta). Alex Guzman has an oiliness and strong accent that utterly suit the French king, Philip. The big surprise is Katie Sapper’s Alais, beautiful as described, and much more forceful, less innocuous and victimized. This is 7-way gamesmanship of the highest order, delectably costumed (Roslyn Lehman & Renetta Lloyd), well lit (Paul A. Canaletti, Jr.) on a set (N. Dixon Fish) that effectively suggests a drafty medieval castle, with an inventive center section that retreats upstage for a change of location. In sum, a wholly satisfying, excellently executed production, guaranteed to make you glad to go back to your own ‘commoner’ problems and relations.